The Expendables have been summoned again by Church (Bruce Willis) to do his dirty deeds. When the new enemy, played by Jean-Claude Van Damme, kills a teammate, they all seek revenge and wreak havoc deep in enemy territory. Going into the movie, one would expect the same tone as the first film — violent, entertaining, comical and full of testosterone. This sequel had that and then some. Unlike the first film, there were no F-bombs — which is astonishing. Most of the violence was tongue-and-cheek and the one-liners were cheesy beyond belief — but entertaining. What would you expect from a film with all of the has-been action stars? If you’ve got a film with Arnold Schwarzenegger, there’s bound to be some of his signature lines. I can’t say that I’ve ever seen somebody shot before — but I’m skeptical about their excessive blood splatter. Excessive and extreme would be great adjectives for a bulk of the movie. But like I said, that’s what makes it fun. These guys are — well — older, and they know it. “That plane belongs in a museum,” said Stallone’s character. Schwarzenegger comically replies, “we all do.” They’re poking fun at their own limitations and age, that’s part of the easy humor of it all. “The Expendables 2” is honestly just fun. I laughed through most of it and stayed riveted to the screen the entire time. It’s comical, enthralling and full of action and macho guys. IMDb currently gives it a 7.7 rating on their scale. Their box office numbers haven’t disappointed either, earning them $28.7 million on their opening weekend alone. And I have to add a shout-out to the theatre to which we went. The Latrobe 30 Theatre and Cafe had an incredible deal of a movie, bottomless drinks and popcorn, and a sandwich platter for only $16. Your comfy seat came complete with a table and plenty of room to stretch out. So not only do I recommend that you see the movie, but I’d highly suggest you go a bit further down the road to Latrobe for a cheap night out. 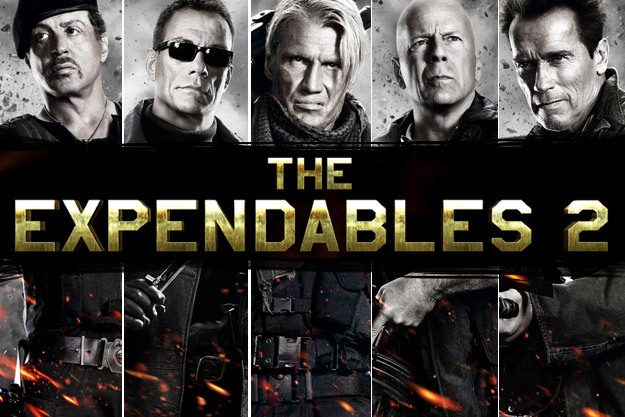 Hopefully “The Expendables 3” is on their to-do list, complete with even more action and weapons. Will there be appearances by Clint Eastwood? Nicolas Cage? Harrison Ford? Steven Seagal? The Rock? We’ll see who they get for the next time around. As for this time though, it’s a great movie — go check it out.